At 26 years old its tough to say someone is in rebuild mode, but that might be exactly where Michael Crouse is at this point in his career. BC’s own, Crouse was drafted by the Toronto Blue Jays in the 16th round of the 2008 MLB June Amateur Draft from Centennial SS. 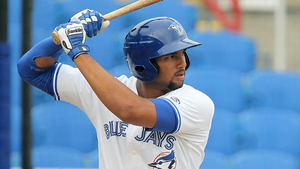 The speedster was with the Jays’ Gulf Coast League team at 17 years old and by the time he was 25, he was in the Independent Atlantic League stealing a league leading 61 bases. 25 years old and out of affiliated baseball? It’s a harsh reality, but Crouse never gave up and that’s why Indy ball is an option and an outlet for players starting out or trying to climb back up that ladder. After missing the 2015 season due to an injury, Crouse’s 2016 season was a coming out party so to speak. He put together, arguably his best overall season; 10 home runs, 67 RBI, 25 doubles, five triples, 61 stolen bases and a .287 batting average. This year has been nothing more of the same for the multi-medal winning member of the Canadian National Baseball team (Gold, 2008 World Junior; Bronze, 2011 Baseball World Cup; Gold, 2011 Pan American Games). At the midway point of the season, Crouse is killing it. His .264 average may not be where he wants it, but he’s right on track with 11 big flies, 37 RBI, and 20 stolen bases, hence why he was named to the Liberty Division All-Star team. It’s numbers like this that keeps those in the front offices interested. It’s also the heart and determination that these players show year in and year out to continually deal with the ups and downs, but ultimately striving to make it to the next level.